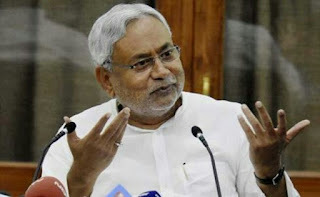 Patna - Amid the political standoff in Bihar, Chief Minister Nitish Kumar resigned on Wednesday evening. He met Governor Keshari Nath Tripathi at the Raj Bhavan and submitted his resignation. Earlier, JD(U) sources told The Hindu that Mr. Kumar may resign, as chief of the alliance partner, Rashtriya Janata Dal (RJD), Lalu Prasad, asserted in the day that his son and Deputy Chief Minister Tejaswi Yadav would not resign over corruption charges. Earlier, Mr. Kumar held a meeting with party legislators and leaders at his official residence and later drove to the Raj Bhavan. The JD(U) and Mr. Kumar have been insisting that Mr. Yadav come clean on the accusations in public which are politically being construed as the JD(U)’s demand for his resignation.